According to the latest issue of Famitsu, Monster Hunter Stories players will have the option to select the protagonist's gender, will have secondary characters assist them, and more. It’s been several months since Capcom announced Monster Hunter Stories for the Nintendo 3DS. Today, we’re learning some details regarding the game as Famitsu published a 6-page story highlighting the game’s story, characters, and battle system. Monster Hunter Stories will allow players to choose between a male and female protagonist, which will always have a Felyne companion accompanying them through their adventure. The game will also have a number of secondary characters to assist the hero. In the feature, Capcom has once again confirmed Monster Hunter Stories will be a JRPG that will have real-time combat. The graphic style features a more cell-shaded approach when compared to the main Monster Hunter series and its overall aesthetics is being done in a way that would entice a younger audience to enjoy. 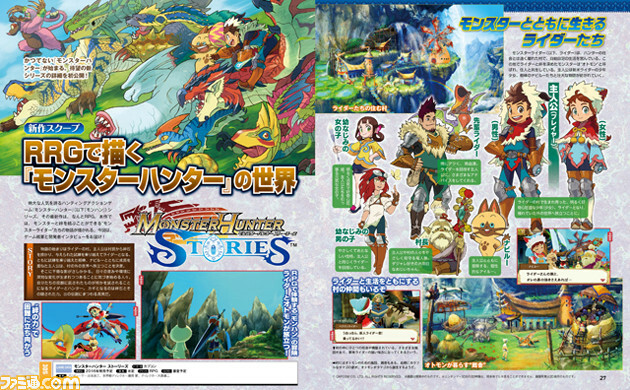 Monster Hunter Stories is scheduled to be released in Japan in 2016. No word from Capcom whether or not it’ll get a a western release. No matter how it's drawn, that damn slug/bat thing is gross as all get out. Bring it on! Im game.